Home / Engagement rings: Custom Design / Solitaire Diamond / “Mirare” yellow and white gold dress ring. “Mirare” yellow and white gold dress ring. Mirror finish yellow and white gold band. The core of the ring is 18 ct yellow gold, and the outer domed rims and bezel are 18 ct white. 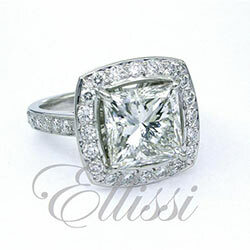 The central diamond is slightly raised off the band and is a princess cut 0.74 ct E/VS1.